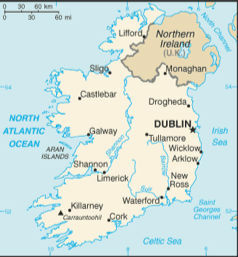 Ireland, or Eire, known as The Emerald Isle and also The Island of Saints and Scholars is located in Western Europe. Ireland is the 3rd largest Island in Europe and the 20th largest in the world. 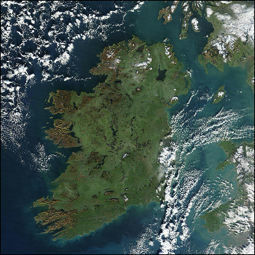 Ireland lies northeast of the European contentment and is surrounded by 100s of smaller islands. East of Ireland lies Great Britain. The two are separated by the Irish Sea. The Island itself is politically separated in two, the Republic of Ireland in the south and Northern Ireland in the north which is part of the UK. According to census data from 2006 the population is somewhere around 6.2 million people, however a new 2011 census is underway. Ireland has a mild temperate climate and is generally very green and thick with vegetation.